Not everyone has a perfect smile. Genetics, trauma and poor oral hygiene can cause your teeth to look unattractive. For many people, having a beautiful smile is a priority. It symbolizes good health and is more likely to make a positive first impression. If you’re interested in improving the appearance of your smile, you have several options to consider at So-Well Dental Associates. Veneers are just one treatment that can enhance the aesthetic of your teeth without significant downtime or inconvenience; however, not everyone wants to experience the amount of preparation that goes into receiving traditional veneers and would desire a more conservative option. Lumineers can give you a celebrity smile without all of the preparation beforehand. No drilling or alterations to your natural tooth enamel are required, and the entire procedure is practically pain-free. Because there is little to no preparation to your tooth enamel, you can pursue additional or more extensive treatment at a later time; however, they are still long-lasting if you decide to wear them long-term. Additionally, you can eat all of your favorite foods and treat your Lumineers just like your natural smile. Lumineers are much thinner than their traditional counterparts, which allows them to be placed on top of your natural teeth without much preparation. They mimic the appearance of bright, white tooth enamel and are stain-resistant. Traditional veneers, on the other hand, have a much thicker consistency, which is why they require tooth reduction so they don’t look bulky on top of your teeth. 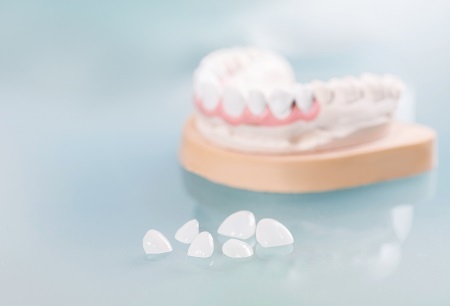 While both procedures are highly effective, Lumineers benefit those who desire the preservation of their dental structure and want the option of removing their restorations later on. Dr. Sowell customizes your treatment to your specific needs. Starting with impressions, Dr. Sowell will obtain the precise measurements needed in order to fabricate your custom restorations. There is no drilling involved and it’s likely that you will not need temporary restorations while you wait for your Lumineers to be made. Once your Lumineers are ready, you will return to Dr. Sowell’s office to be fitted for your new teeth. Dr. Sowell will make sure that your veneers are comfortable and look natural. Once you are satisfied with the way they look, they will be cemented into place. With proper oral hygiene and a healthy lifestyle, you can expect your Lumineers to last upwards of 20 years. Contact Dr. Zenobia Sowell Today! Lumineers have revolutionized minimally-invasive cosmetic techniques and allow you to achieve a Hollywood smile without significant alteration to your natural teeth. If you desire a more attractive smile but want to achieve it with as little tooth reduction as possible, then contact So-Well Dental Associates today! We offer cosmetic dental treatments to patients in surrounding Chicago areas including Streeterville, Lincoln Park, and Gold Coast.